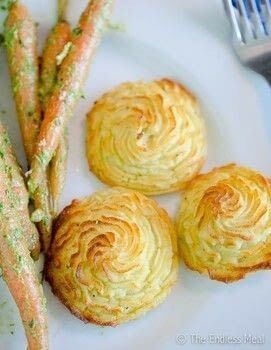 https://www.cutoutandkeep.net/projects/duchess-potatoes • Posted by Kristen S.
Peel the potatoes and cut in quarters. Place in a large pot and fill with cold water. Bring the water to a boil until a fork easily pokes through the potatoes, about 10-15 minutes. Drain the potatoes and set aside to cool slightly. Once the potatoes are no longer hot to the touch (you don't want to scramble the yolks) add the egg yolks, butter, cream, salt, pepper and nutmeg. Using a potato masher or electric beater mash the potatoes until smooth. Taste for seasoning and add more salt and pepper if needed. Don't be shy with the salt. Optional step: For extra smooth potatoes you can work the potatoes though a fine mesh sieve with the back of a wooden spoon (this is how I do it but it is a bit of a chore) or use a potato ricer. Preheat the oven to 375 degrees. Put the mashed potatoes in a pastry bag fitted with a large star tip. Line 2 baking trays with parchment paper. Pipe the potatoes into 3 inch round circles on the parchment paper. Whisk the whole egg with a fork and gently brush over the potatoes; you may have some left over. Bake the potatoes for 25-30 minutes, or until they have started to turn brown along the ridges. Make ahead: To make these ahead prepare them up to step 4 up to one day in advance and store them in your fridge. Remove them from your fridge 15 minutes before you are going to bake them and continue with steps 5, 6 and 7.